Carmarthenshire has fantastic landscapes and lots to see and do. It is known as ‘the Garden of Wales’ for good reason. There are gardens and nature reserves, parks, castles, houses, forests and hills to look at and explore, either on foot, by bike or car. Llandovery is a traditional Welsh market town in the Upper Towy (Twyi) valley, bounded by three rivers. Its name means ‘church amidst the waters’. It has a historical heritage dating back to Roman times, was an important drovers’ town and it has ruins of a Norman castle and also churches and some fine Georgian houses. The striking statue of Llywelyn ap Gruffydd Fychan, a supporter of Owain Glyndwr’s struggle for Welsh independence, stands by the castle ruins. Llandovery holds an annual Sheep Festival at the end of September, well worth a visit. There are walks from the Lodge as well as close by in and around Cilycwm, Rhandirmawn and Llyn Brianne Reservoir – all offering beautiful places to walk, cycle or drive. Stop off at the Dinas RSPB Nature Reserve for a stunning walk along the river and through alder and oak bluebell woodland. Cwm Rhaeadr, Brecfa and Crychan Forests offer woodland and waterfall walks and mountain biking paths. Also check out the nature reserves of the Brecknock Wildlife Trust. Myddfai (approx 3 miles away) is now the Welsh residence of the Prince Charles, Prince of Wales. The ‘Physicians of Myddfai’ from medieval times became renowned for herbal remedies and they are also associated with the local legend of the Lady of the Lake Llyn-y-Fan Fach. The house is at the western edge of the Brecon Beacons National Park, an area of special landscape, wildlife and cultural heritage, and Fforest Fawr Geopark, the area designated in 2005 by UNESCO because of its outstanding geological heritage. A trip on the ‘Heart of Wales‘ Railway line offers the opportunity to see some spectacular scenery including the Cynghordy Viaduct. Not far away are the ruinous abbeys of Strata Florida and Talley, both founded in the 12th century. The town of Llandeilo is also very attractive with upmarket shops, cafes and restaurants. There are many castles – in Llandeilo there’s Dinefyr Castle – and our favourite – Carreg Cennen Castle – one of the most dramatic fortresses on top of a limestone crag and with fantastic views. 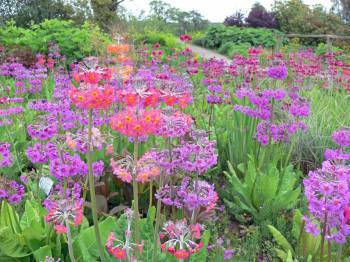 Aberglasney Gardens and the National Botanic Gardens of Wales are essential visits for all those who love gardens. Dolaucothi Roman Gold Mines (National Trust), the only Roman goldmine in Wales, is another fascinating visit for all those interested in history. Llandeilo 12 miles – upmarket shops and restaurants. 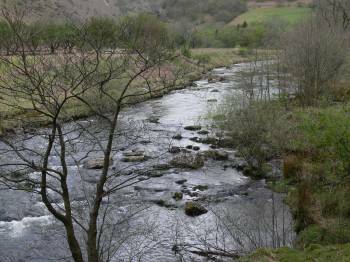 Great pub with food, Neuadd Fawr Arms, ½ hour walk along country lane following Twyi river in Cilycwm. West Coast including towns of Aberaeron, New Quay, Aberystwyth, approx 50 minutes.